My name isDaniel Weaver. 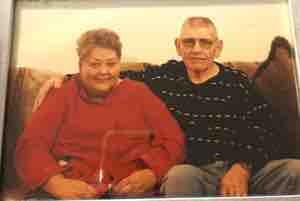 The photo you see is my grandma Nancy, and my grandpa Ed. February 6th, 2017, at around 7:50 A.M. my grandma passed on at 74, losing her drawn out battle with COPD. My grandparents have been married for 57 years and together for 60+ Years. My grandfather has always been a meticulous, well organized and very responsible man. Because of the way my grandpa is, I assumed he had a life insurance policy on my both him and my grandma for years so when the time came everything was taken care of. When my mom told me there was no money to bury my grandma I was confused. She told me that my grand parents hadn't been married that long when a man started going around in their neighborhood door to door selling life insurance policies. So the man would come around once a month and collect a couple hundred dollars from my grandpa and some other people. Eventually the man quit coming around, and everyone found out it was a scam, the life insurance policies were fake and all that money was gone. So he never paid into life insurance again. For the last 15-17 years my grandparents have been scraping by on what little money my grandpa was able to save and social security checks. They never had a plan for what to do when this happened, they weren't prepared in many ways and financially was one of them. My grandpa wants my grandma to be buried, and when the time comes, he wants to be buried right next to her. I feel like that is reasonable. But he can't afford to have her buried and he can't afford to have her cremated. Sorry for your loss Danny! Love you so much! Wishing your family the best in this time of grief.